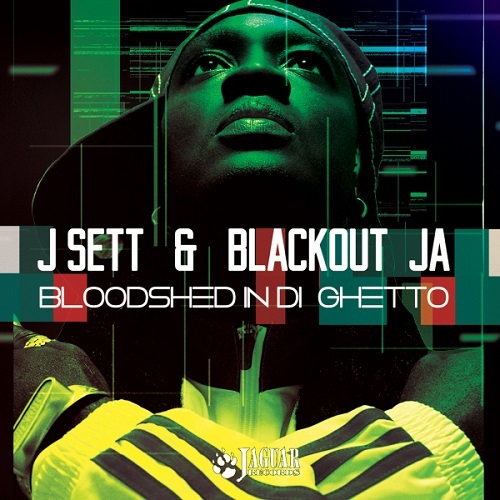 Jaguar Records presents a beast of a collaboration between producer J Sett and Vocalist Blackout JA. Bloodshed In Di Ghetto starts off with reggae style percussion and chatting giving the listener that authentic dancehall/ yard feel. Steady drum and bass style drums come in to get the tune moving and Blackout JA doesn’t miss a beat. With dancehall style vocals, riddim keys moving it along and a relentless bassline rumbling underneath this track is sure to smash the floors in the dance! Nice to see some original vocals being implemented in jungle rather than the same tunes we’ve all remixed time and time again. This is the move jungle needs, come original! Audiomission runs his remix outside of the dancehall and closer to the club. While he retains the horns and basic melodies the dnb backbone is much more apparent in this version. The drums step up right out of the gate and he backs it off for a quick breakdown before the drop, teasing the vocal chorus with some FX. Once the drop hits jumpy dnb style bass starts bubbling around while Blackout JA runs the lyrics. Smashing remix for the dnb heads!! Jamie Bostron knocks his remix out of the park with a huge nod to the original while updating the drums and bass to true Jamie Bostron style. Into starts similar but with keys instead of percussion, letting Blackout JA get things warmed up. The drums quickly come in and get this one moving towards the drop. Once the drop hits it opens beautifully to the chorus and a few spacey delayed FX. It all comes back together for the drop and a the keys are retained as stab FX with delay while a fresh bouncy bassline comes in and takes the attention of the listener. With well calculated timing changes and pauses in the bassline this one stays running till the last drop!